Brushing and flossing can help prevent decay and keep your teeth healthy. This routine keeps decay-causing plaque from forming on your teeth, which in turn maintains optimal oral health. While people know they should brush and floss their teeth, they often become confused deciding if they should floss first or brush first. Does It Matter to Floss Before or After Brushing? It simply doesn't matter. Instead of worrying about when to floss, you should pay more attention to how to do it right. Your focus should be on doing a thorough job and you will get maximum benefits. Some people do it before brushing, while others do it after they have brushed their teeth but the results have always been quite the same. If you have been flossing before brushing your teeth for the last ten years and have never faced any serious oral health problem, there is no point in changing the routine. If it is working well the other way round, you should continue flossing after brushing. It is more important to floss your teeth daily and use water to rinse your mouth thoroughly after flossing. You need to understand that brushing your teeth will help remove plaque from tooth surfaces, but it will not remove plaque completely. There is debris between the teeth that can be removed only through flossing. It is fine to use another type of interdental cleaner if you are not all that comfortable with flossing. Some of these aids include special picks, brushes, and sticks. Be sure to talk with your dentist before you decide to use interdental cleaners. Whether you should floss before or after brushing can be quite confusing, but you should not delve too much into finding the answer and lay your emphasis on learning the right technique to brush and floss. Change your toothbrush whenever necessary. 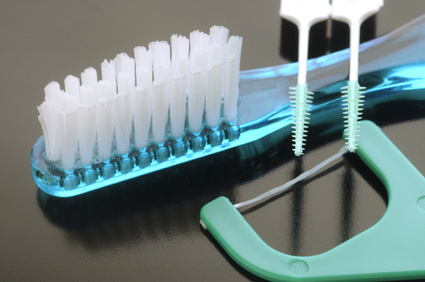 Be sure to replace your toothbrush as soon as you notice any signs of wear. It is usually better to change it once every three months. Change your toothbrush after you have had a cold because the bristles can collect germs and make you sick again. Know what type of brush is right for you. Most dental professionals are of the view that you should use a soft-bristled brush to remove debris and plaque without hurting your gums. Small-headed brushes are also effective because they can reach all areas of the mouth. Using a powered toothbrush is also a good idea, especially for people with limited manual dexterity. Start brushing by keeping your brush at a 45-degree angle to the gums. Move your brush back and forth in short, gentle strokes. Brush thoroughly and clean the inner surfaces, the outer surfaces, and the chewing surfaces of the teeth. Tilt your brush vertically for proper cleaning of the inside surfaces of the front teeth. Make up-and-down strokes for better effects. Do not forget to brush your tongue to get rid of bacteria. As mentioned already, you should be least concerned about deciding if you should floss before or after brushing and pay more attention to doing it right. Here are a few tips to remember to floss your teeth properly. Always use enough dental floss. You should consider breaking off a piece of about 18 inches in length. That may sound a lot, but you need enough to cover all your teeth. Wrap most of dental floss around your index finger or middle finger of one hand and wrap the rest of it on the same finger of your other hand. Slide the floss between your teeth as gently as possible. Move it in a zigzag motion without popping it between your teeth. Wrap it around your tooth and make a "C" shape. Starting from the gum line, move it up toward the top of the tooth. Move to the next tooth and unroll a fresh section of your dental floss. Use your thumb to maneuver the floss. Always remember to floss the backside of your teeth as well.